After spending 15 years exploring the hidden corners of ambient jazz, Iain Ballamy and Thomas Strønen still have not run out of ways to explore their chemistry. Considering the kind of company they have kept in the past, the Food collective has been long been labeled a jazz act. This is neither entirely true or false. 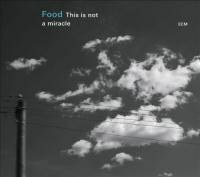 Food, the teamwork of British saxophonist Iain Ballamy and Norwegian drummer Thomas Strønen, may work with jazz elements but their methodology of tying them together has more in common with avant-garde electronic music. When Ballamy and Strønen, usually aided by a rotating cast of guest musicians, take the final product out of the oven, it tastes like nothing else. Hearing their 2010 album Quiet Inlet was a miniature revelation for me, a shining example that jazz and electronic musics can co-exist in the same fabric without one genre jabbing its elbows into the other. For This is Not a Miracle, Food's approach of jam-then-record gets altered a great deal. Instead of jamming the songs into recognizable shapes, Ballamy, Strønen, and Austrian guitarist Christian Fennesz spent hours recording their jams while never attempting to hone them into concise songs. Strønen took the music home with him and spent five months slicing and dicing the jams. This Is Not a Miracle is the result of the heavy editing and thankfully the process has not diluted the power that Food have displayed in the past. In addition to all three musicians having the word "electronics" added to their credit, Strønen enlisted the help of recording engineer Ulf Holand who "pulled the music of Food closer to a rock or electronica sense of expression", as he put it. It's worth noting that when Strønen uses the word "closer", the jazz and ambient aspects of Food aren't left dying on the vine -- they just have more competition than usual. In this way This Is Not a Miracle is a slightly less patient version of Food. "I wanted to make something that was close to our best improvised moments, live, but expressed as shorter passages," explains Strønen. "So I cut the music to the bone." With 11 songs clocking in a 47 minutes, I'd say he succeeded in being succinct. Like Food's other albums, the sounds on This Is Not a Miracle are able to walk that mysterious line between music made up on the fly and music that is thoughtfully arranged. As "Where the Dry Desert Ends" hits its stride, the interplay between Ballamy's sustained tones and Fennesz's loops don't sound like they could have unfolded in any other way. The beat introduced by Strønen can hardly be described as lazy of "jammy". The title track finds Ballamy playing a melody that's almost too smooth and subtle to be noticed thanks to the idiosyncratic rhythms surrounding it. "Sinking Gardens of Babylon", at least from the outset, thrusts forward the rock tendency that Holland allegedly brought to the project -- though "rock" music viewed through the lens of Christian Fennesz is hardly a straightforward notion. The electronica angle means that Food continues to hold their hand close to their chests while never revealing the wild card. No matter how uptempo "Age of Innocence" may be, it's still dark and mellow. Since finishing This Is Not a Miracle, the current Food lineup has learned how to play Strønen's stitched-up mutant in a live setting. It may not sound exactly the same in-concert, but that's music for you. Even where there are machines are play, there is an organic element that can't help but barge in thanks to the human experience. Food, as usual, give us the tastiest of both worlds on another quiet winner that lives up to the ECM name.